Today's kids need to know how to go about getting revenge for the murder of their daughter using the skills they acquired as a top-secret secret government operative. 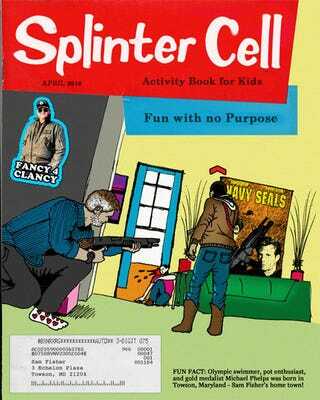 The Splinter Cell Activity Book for Kids can help. Splinter Cell: Conviction is right around the corner. Are your children prepared? IGN put together this handy book of fun activities to help kids prepare to leave a swath of death and destruction in their wake in their bloody quest for vengeance. There are mazes, and Mad Libs, and even a special guest appearance from the original stealth action hero, Mr. Snake. I don't know what's in the water over at IGN, but I imagine it's delicious.